Hello, everyone! A lot has happened in the past twenty-four hours. Hurricane Harvey has been rapidly increasing in strength as it swirls over the Gulf of Mexico and Taylor Swift dropped her first single after a crazy week of ominous promotion. This article is about the later, but, first, I want to say that I hope everyone stays safe during this hurricane. I will maintain my posting schedule to the best of my ability as the storm continues to approach, but in the event of a power loss, I'll do my best to upload as soon as possible. 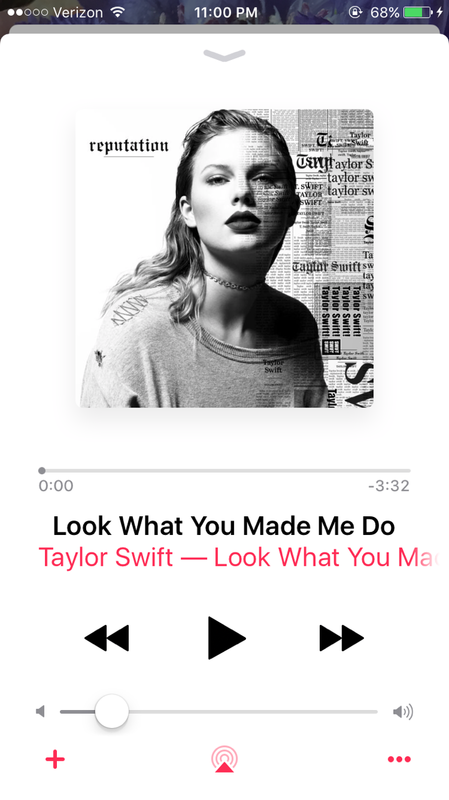 Today, I wanted to discuss the latest song from an artist I've loved for a very long time, Taylor Swift and her new single "Look What You Made Me Do". I'm curious to know what you think about this plunge even deeper into mainstream pop as I haven't even quite figured out what I think myself. Last night, Taylor Swift released her first single off the Reputation album coming on November 12. After wiping her social media, Taylor slowly started posting silent clips of a serpent, leading fans to believe that her next album was coming, and they were right. It also served as a first warning about this new era of Taylor we are all entering. As with any artist in any medium that I absolutely adore, it made me nervous. What if the new music is bad? What if the next book they write is horrible? Will I ever be able to enjoy their other work the same way? Everyone told me that Taylor had made five other solid albums, there was no way this could go bad. So last night, I sat by my phone checking Twitter constantly for the news that Taylor had dropped her new single, and when it finally appeared under my music, I couldn't play it fast enough. 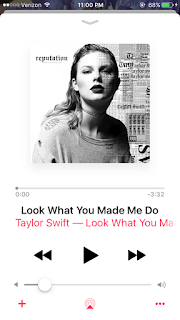 The new track, "Look What You Just Made Me Do", filled my house with an echoing sound unlike anything I'd ever heard from Taylor, or really anyone for that matter. And that scared me at first. There was a DJ infested dance beat, her voice was masked by layers of other sounds battling to reign supreme as the track shifts and changes from verse to pre-chorus to chorus as well as a palatable anger that seeped through every last word. Everyone around me was as shocked as I was, but I'd felt this coming with the wave of new promotion, the snake videos, and the black and white album cover with a darker feel and newsprint overlay. Taylor's new song left me wondering what to think. I went back and listened to her old songs that started with twang and shifted toward stories with beautiful instrumentals and then became a new kind of pop full of captivating background and lyrical masterpiece. And then I listened to Taylor's new single again, looking for Taylor in a song that was so far from anything she'd even hinted at in the past. The conclusion I came to, after a few repeat listens, was this: Any pop singer could have sung the song, only Taylor could have written it. In one of the biggest musical evolutions for such a popular singer, Taylor has been slowly nudging us through new ideas and shifts in genre, and we've been taking baby steps towards new eras with bits and pieces of the old Taylor to hold on to, and now she's pushed us off the cliff with no looking back. As she says in the song, "The old Taylor can't come to the phone right now. Why? Oh, 'cause she's dead." Now I've listened to the song enough times to try to sort out an opinion. It's been harder than I thought it would be. Taylor has laid out an ultimatum to her followers, some of the most loyal in the music industry. This is her music now, take it or leave it. It is a move that will alienate some of her most loyal followers and attract others who have never liked her music. Regardless, she's reached a level where failure becomes a minuscule thought in comparison to making statements. And so I tried to figure out where she was coming from with the song. There are so many different interpretations. Did she let the media storm get to her? Is this her letting them win? Possibly; many people think so. But maybe this is Taylor's way of taking Blank Space further. She's created her own personal anthem that takes hold of and embraces everything people say about her; I think Taylor is now taking the stance that she'll play the role she feels the world is shoving at her. While this isn't what I expected, and I'm not in love yet, I'm definitely not writing off Swift or her Reputation album just yet. Though this single is dance/urban pop centered and not at all what I expected, the storytelling, lyrics, and authentic emotion is still buried in there, which gives me hope for the other fourteen songs left on the album. What do you think of the this new era of angst and anger for Taylor? Are you ready for TS6? Let me know in the comments.